Side-swept hairstyle can make anyone look lovely; in Charlotte Casiraghi’s case,..
Side-swept hairstyle can make anyone look lovely; in Charlotte Casiraghi’s case, it’s lovelier. How-to: Swirl 2-inch strands along the barrel of a hot curling iron. Mist a large-toothed comb with some hairspray with light hold before you glide it through your hair to break out the curls. For a little surprise at the back and to force the style to stay in one side, twist your hair starting at the back of your right ear all the way to the nape. Make it stay put by adding a glitzy clip. 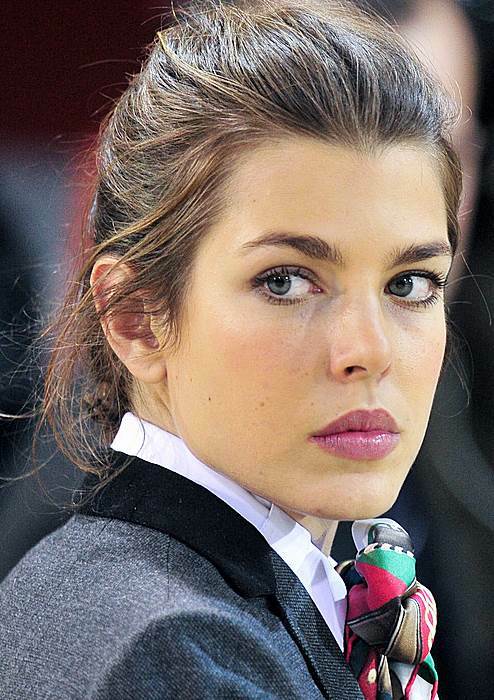 It’s not surprising to see Charlotte Casiraghi turn out this way what with Grace..
It’s not surprising to see Charlotte Casiraghi turn out this way what with Grace Kelly’s genes embedded in her system. Simply gorgeous! The soon to be momma’s laid-back messy updo creates an effortless chic aura that’s perfect for special occasions.